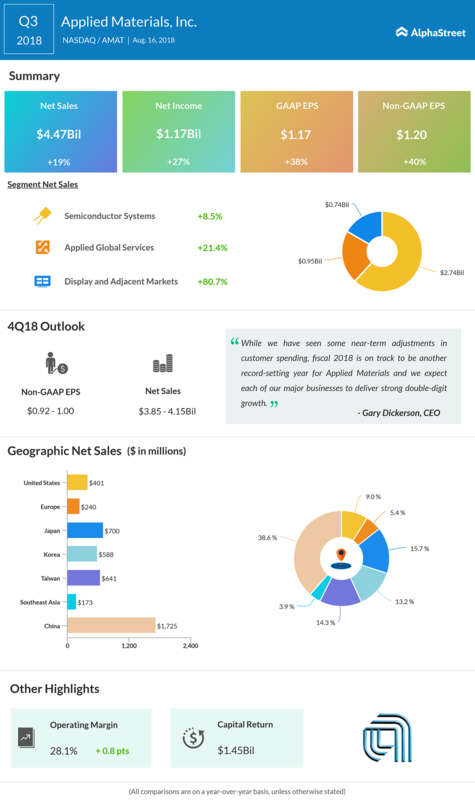 Applied Materials (AMAT) reported a 27% jump in earnings for the third quarter driven by double-digit growth across its segments and geographies. The top and bottom line results came in above analysts’ expectations. Shares of the chip gear maker fell more than 4% in the after-hours trading following the weak outlook. Profit for the quarter climbed by 27% to $1.17 billion, while earnings soared by 38% to $1.17 per share. On an adjusted basis, earnings grew by 40% to $1.20 per share. The rise in the bottom line results was driven by double-digit growth across the company’s segments and geographies, especially Japan and China. Revenue surged 19% year-over-year to $4.47 billion. The company has been investing in high growth markets with greater margins, in turn improving operational efficiency. Applied’s high growth market China and Japan showed its growth momentum in the third quarter, with year-over-year revenue jumps of 123% and 58%, respectively. China and Japan regions were the highest revenue contributors, accounting for 39% and 16% of total sales, respectively. The United States and Europe also posted double-digit increases in revenue, offset by dismal sales performance in Korea. While Applied Materials’ all three segments performed better than expected, Display and Adjacent Market segment posted a standout performance with an 81% jump year-over-year. Sales from Applied Global Services increased 21%, while that from Semiconductor Systems rose by 8.5%. For 4Q18, Applied Materials expects sales in the range of $3.85 billion to $4.15 billion. Adjusted EPS is expected to be $0.92 to $1.00. For the fiscal year 2018, the company predicts net sales in the range of $17.1 billion to $17.4 billion and adjusted EPS in the range of $4.41 to $4.49. “Our future outlook remains positive as the A.I.-Big Data era requires new breakthroughs in technology, from materials to systems, providing Applied with a great opportunity to play a larger and more valuable role in the ecosystem,” executive chief Gary Dickerson said. Shares of Applied Materials ended Thursday’s regular trading session down 0.17% at $47.43 on the Nasdaq. However, the stock has gained more than 6% in the past one year.